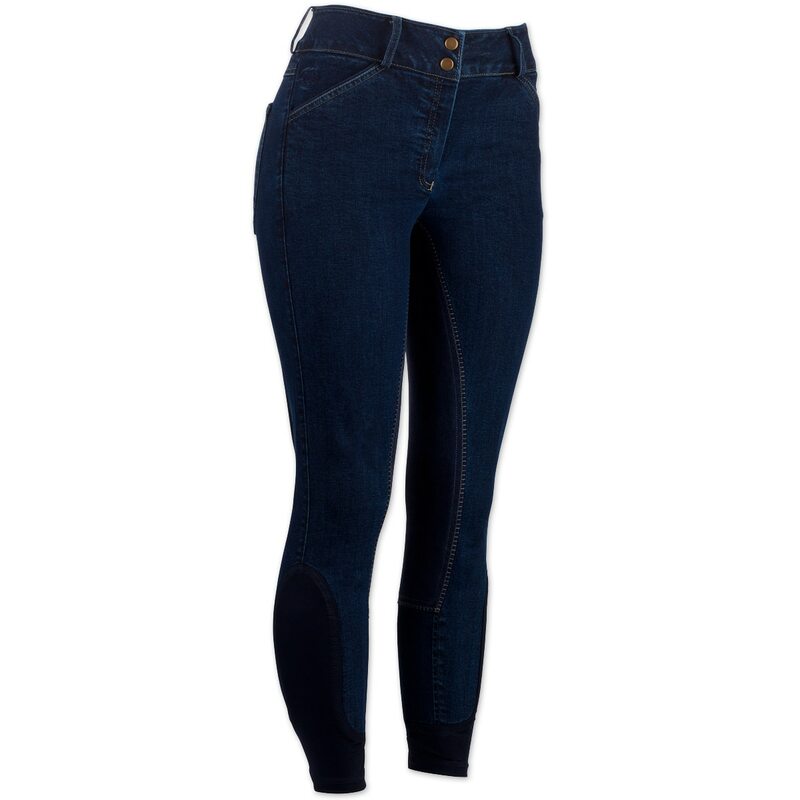 The Piper Breeches by SmartPak- Denim Full Seat are too fun to buy just one! In addition to durable materials and fantastic fit, the Piper Full Seat Breeches by SmartPak come in a variety of fun colors with all the fashionable details you've been looking for in a pair of schooling breeches. Piper Breeches by SmartPak- Denim Full Seat is rated 4.2 out of 5 by 16. Rated 5 out of 5 by TracyV from Love the lightweight material My girlfriend borrowed my original pipers a few months ago and never gave them back, as she loved them, so she wanted to replace mine. I suggested these denim ones, so she ordered us each a pair. I'm on my fifth ride in them and love love love these better than the original Pipers. The material is lighter weight I think, Good stretch around the knees. I ordered my same size all others pipers. Good buy. I'm ordering another pair! Rated 2 out of 5 by KikiK from Not a great fit for the bootylicious among us. I'm always longing for a full seat jean breech that fulfills all my specific needs but alas, it was not these Pipers. The waist was too big and the rise too low to encompass my fine heinie. Going up a size would not have helped due to the waist gap. For the record I bought a 36 and usually wear a 32-34 including in regular pipers so FYI for the curvy girls out there! Great quality breech for the slimmmer set though. Rated 3 out of 5 by Lynn from So cute I was hoping that these would work for me. The fabric is very soft and stretch, but they were definitely riding too low on the backside. Maybe great for girls with no bums that would allow the back of the waistband not to tug down. Rated 5 out of 5 by Diane from Favorite “jeans” ever! I want 6 more pairs so I can wear them every day of the week! These are the softest and most comfortable jeans/breeches I’ve ever worn. They seemed a little snug when I put them on (don’t try on pants right after eating LOL) but when I put them on before work, they fit perfectly and I ordered the same size as my other Piper breeches. I also love that I can wear all of my Piper breeches to my office job and not have to change before heading to the barn. Bonus: I get lots of compliments from non-riders on my breeches and Solstice boots. Gotta love being able to pass riding attire off as office attire! Rated 5 out of 5 by Dida from Love Them! Boyfriend bought me these for Christmas and I'm in love. For me they don't feel quite as stretchy as the normal pipers, but it's not a big deal! A few rides in and they're to die for. Fit wonderfully (5'1 with curves for being under 120lbs), and look super cute. Seem to be very durable, do not snag as easy as normal pipers, and look great when riding! Going to wear them to classes this semester to avoid changing before the barn, they are that comfy! Rated 4 out of 5 by none from Very comfortable I have worn these twice. 3 great features: 1st, very comfortable; 2nd, they fit my big waist and very skinny legs, almost impossible to find; 3rd, very light weight which works for the hot climate I live in. Major drawback is that the waist keeps rolling down. I have to constantly pull them up. Even with this I would buy another pair. Can't speak to durability,haven't had them long enough. Rated 2 out of 5 by Equest1 from Love them at first I bought these breeches and initially loved them, as they felt and looked great; however, altering wearing and washing them 3-4 times (always in cold, hung to dry), they have stretched out in the seat and knee area, and are very baggy. I read the other reviews and am surprised that other says they do not stretch. I do not have a lot of curves and am on the thing side. Am disappointed. Rated 4 out of 5 by Joonthehills from Spiffy So I’ve been wearing these denim Pipers for over a month now, including a few washings. They fit fine, a tad tight in the knees compared to my other favorite Bootcut Pipers, due to different fabric and, of course, the full seat ultrasuede . That said, they are comfortable and stylish, and for summer riding, cooler then my other Pipers. Love all the pockets and the sock bottoms. The waist didn’t give my middle age waist a “muffin top”. Bottom line : glad I purchased these. Rated 5 out of 5 by Indiemusicgirl from Love These! These are super stretchy and super comfortable. It's like wearing your favorite pair of jeans to the barn. Rated 5 out of 5 by Nightskipper from Good quality, great price! I thought that SmartPak only sold vitamin packets for horses. What a surprise when I came across their booth at the World Equestrian Games at the Tryon International Equestrian Center last month. Their clothes are just wonderful! The sales staff were so friendly and helpful! I bought Piper T-shirts and affordable full seat denim britches which I had been looking to buy for years! All their Piper line products are comfortable, light weight and don't hurt the pocket book! I am so happy to have found them! When I need riding clothes from now on, I will check with SmartPak first!